Lock in a great price for Saragossa B&B - Saint Augustine – rated 8.4 by recent guests! Close to everything! Cute room. Friendly hostesses. This facility is being run by two young ladies. It is obvious that they are unable to do deep cleaning or painting. The place was in desperate need of repair. The breakfast was simple and adequate. The coffee in the room was awful!! If possible stay at another b and B. The price was too high for this place. The beds were very comfortable, the space was very clean and the little kitchenette area was a nice bonus. The area is absolutely lovely and extremely close to all of the historic district. It's a short, beautiful two - three minute walk walk to the shops and restaurants in the historic area but even the view down the road is beautiful. Breakfast was nice, but I expected a little more than what we were served. I heard "three course breakfast" and expected something pretty fancy for the price but it was something I would cook on the weekends. Found it to be very cozy and warm. Liked the parking arrangement and the fact that we were able to leave our car there while we toured the city. Location and amenities made it a very pleasurable experience? Staff was very friendly and helpful. Love the location, just a short walk through a beautiful neighborhood to Cordova. Nice and quiet seculeded and private parking in back of property. Very nice setting, location and decoration. Nice employees and good breakfast. Price reasonable for the area where located. The staff was great! Breakfast was excellent and varied each morning. Have stayed in 4 Saint Augustine B&Bs and the Saragossa has been our favorite. Saragossa B&B - Saint Augustine This rating is a reflection of how the property compares to the industry standard when it comes to price, facilities and services available. It's based on a self-evaluation by the property. Use this rating to help choose your stay! One of our top picks in St. Augustine.Located in the historic Saint Augustine city center, this bed and breakfast features a 3-course brunch. All rooms and suites at this converted single-family home have a private entrance from an outdoor patio. Castillo de San Marcos is 5 minutes' walk away. Free WiFi, a microwave, and a small refrigerator are included in all rooms at this Saint Augustine Saragossa B&B. A cable TV, coffee-making facilities, and an private bathroom are also provided. In-room massage services can be arranged for guests of the Saragossa B&B. Free parking is available to all guests. Saragossa B&B is located 2,150 feet from the Saint George Street shopping district and 10 minutes’ drive from the beach. 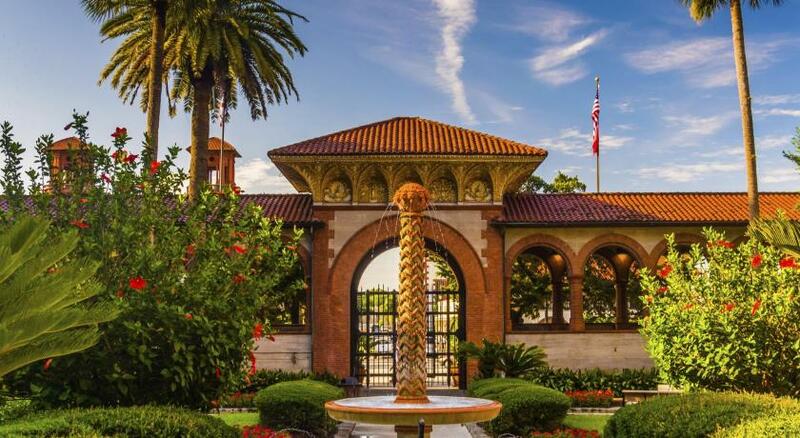 Flagler College is just 5 minutes’ walk away. This is our guests' favorite part of St. Augustine, according to independent reviews. 뀐 Located in the top-rated area in St. Augustine, this property has an excellent location score of 9.1! When would you like to stay at Saragossa B&B - Saint Augustine? This spacious suite has a microwave, refrigerator, and cable TV. This spacious suite features a microwave, refrigerator, and cable TV. The highlight of St. Augustine’s old town is the view over Matanzas Bay. 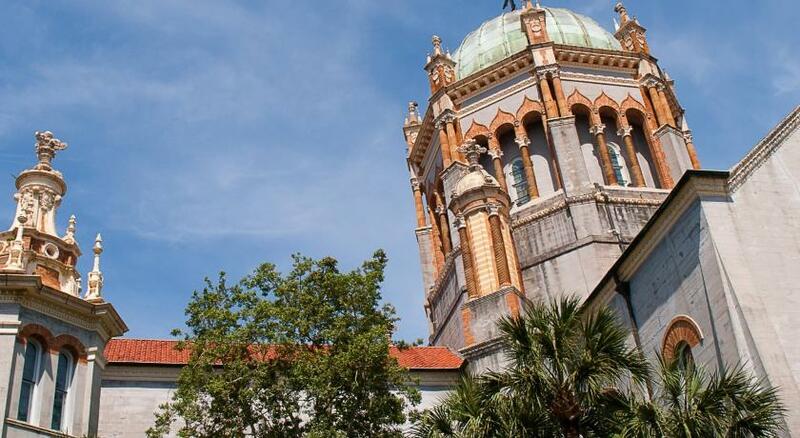 Explore the old fortress walls inside the 300-year-old San Marcos Castle as well as the interesting collections in the Lightner Museum. House Rules Saragossa B&B - Saint Augustine takes special requests – add in the next step! Free! Up to two children under 1 year stay free of charge when using existing beds. Any additional older children or adults are charged USD 29 per person per night when using existing beds. Saragossa B&amp;B - Saint Augustine accepts these cards and reserves the right to temporarily hold an amount prior to arrival. Saragossa B&B - Saint Augustine accepts these cards and reserves the right to temporarily hold an amount prior to arrival. Please note that brunch is based on availability at 9:30 am and 10:30 am. Contact the property for details. Only select rooms can accommodate pets. Contact the property for details. One of the most picturesque neighborhoods in St. Augustine! Bed was very noisy to the point of being uncomfortable and embarrassing (and that was just for normal use!. Bathroom very small. Shower very small. Awesome, very comfortable, great breakfast..
One table lamp on the dresser has a shorted light socket switch. There is a piece of blank paper taped to the wall behind the left night stand, unknown reason. The hair dryer is oily and slippery. The shower was in a footed tub so the shower curtain inside the tub felt claustrophobic. Also the water pressure was poor. The breakfast was good but the time was limited. The day we left we wanted to leave early so was unable to stay for breakfast. My husband enjoyed sitting on the porch outside the room. Our room & bathroom was a bit tight but overall comfortable enough. Loved the beautiful residential quiet street that was within easy walking distance in the the heart of the historic district. Loved our breakfast & talking with the great couple at our breakfast table. I didn't like the terribly small dining area. I am very uncomfortable making small talk with strangers or really talking to anyone I don't know & to me mealtime is personal with friends or family so having to be at a table with strangers made me so anxious. The only other negative thing I have to say is that I wish there would have been a darkening curtain over the front door because the porch light stays on & I like complete darkness when I sleep. These are just my preferences and I imagine something I may not like wouldn't bother someone else so for what it's worth I would definitely it it & go there again. Place was dark inside, had to climb a stairway to breakfast area which was very difficult for senior citizen. Location and staff were great. Rate is is to expensive for what you get. Was not provided with statement. Perhaps option for an alternative to meat as a side dish. For instance potato based or oatmeal that could be substituted if reqested. Breakfast was a strange affair. Breakfast was at 9.30 and if you were even minutes early you wernt allowed in and if you were late you were only allowed coffee and cake. Very clean rooms and great location and parking. Room was very comfortable. Ceiling fan light didn't work. Electric outlets were hard to find outside of the bathroom. The mirror in the bathroom was a little too high.